A944 Aberdeen to Alford road turn off at the Ordhead junction (Before Millbank coming from Aberdeen) and follow the road signs. 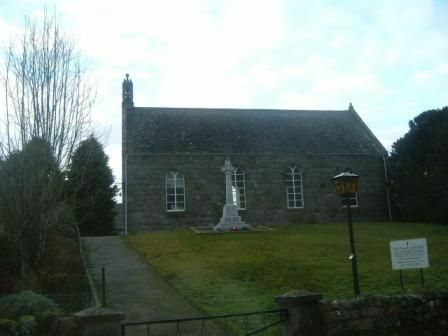 The Church is situated at the end of minor road behind Cluny Castle and Cluny Home Farm. It is signposted Cluny Church, Cluny Graveyard. There is a car park behind the church which has a ramped path all the way up to the church. If necessary cars can be driven up the tarred access path at the front of the church to allow access to the church. The present Cluny Church dates back to the late 1700's or very early 1800's there is some debate about when it was built. It stands on a small hill on what was once the main Alford to Aberdeen road but which is now a side raod/ track. This was a prominent site for a church and there has been Christian worship in the area from 13th century. In the old grave yeard there is a prominent Mauselum to the Fraser family who once owned the nearby Castle Fraser.